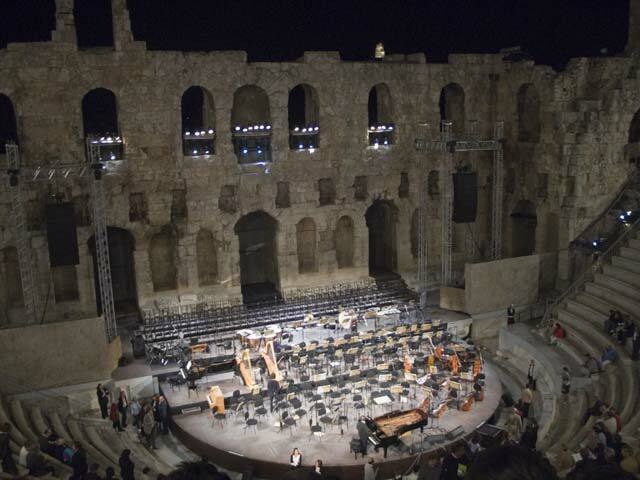 I’ve said it before, and I am certain I will write it many times over … an evening at the Herodeon is magic, and promises to be a highlight of any stay in Athens. The ancient theater on the southern slope of the Acropolis, another project brought to Greece by Athenian magnate Herodes Atticus (this one in memory of his wife, Aspasia Annia Regilla – I never have figured out why we don’t call it the “Regilla” or the “Aspasia” instead of the Herodeon) has hosted a lot of big names throughout the years, but in this particular case I’d say that the venue is more important than who is performing, so if you happen to be in Athens on a day when there is a performance, any performance, do yourself a favor and get tickets. Tickets may be ordered online via the festival website THREE WEEKS PRIOR TO THE PERFORMANCE. Prepare for your Athens visit, treasure hunt! Please email me the schedule of concerts at the Herodeon arena for 2013. Efkaristo. Please email me 2013 schedule for Herod Atticus theatre. If you would like the schedule for the Herod Atticus theater for 2013 please join our fan page and you will receive a notice when it is published – usually in the late spring. You can find us on Facebook here: http://www.facebook.com/GreekVRS or you can follow us on twitter at: http://www.twitter.com/greekvacations. Please send us the 2013 Summer schedule for the Herodes Atticus Theater Festival and the Epidaurus Theater Festival when it becomes available. Thank you. i’d love to receive any information about theatre performances in the Herodes Atticus and other theatres/performance spaces including the Epidaurus and Little Epidaurus. Really appreciate your offer of help. The performances at the Herodeon and in Epidaurus have not yet been announced for 2013. As soon as they are I will post them here and on Facebook. If you follow me on Facebook (www.facebook.com/GreekVRS, you’ll be among the first to see the calendar! Thanks for visiting. Please send me 2013 festival program, especially for Athens area. Love seeing anything at the Herod Atticus. I would appreciate it if you would please email me the 2013program of performances at Herodeon Atticus Theater and at Epidavros. We are coming to Greece tins summer and would like to purchase tickets in advance.